I’ve tested with Win10 and Mac Sierra, and the Solaris is being recognized right away over USB in both cases (using 1.4). Jim is aware of your report, and so any other details you can provide would be helpful. I tried it using Windows 10 Home 64 bit with no problem. Will ask Jim to check what else it could be. 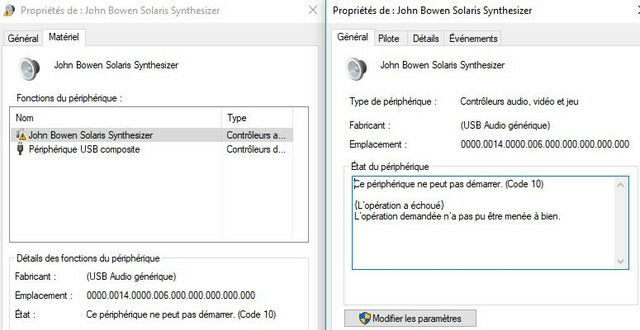 In the Solaris, go to the MIDI page and make sure that MIDICtrl is On. 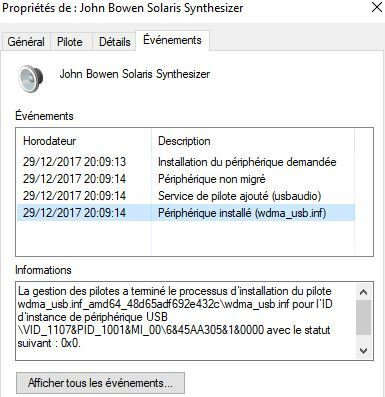 With the Solaris USB cable plugged in, do you see John Bowen Solaris Synthesizer in Device Manager? It should be in the section called Sound, video, and game controllers. If it is there, does it have an error? What software are you using to test whether the Solaris is working? For people having trouble on Windows, please try using the free program MIDI-OX. Select Solaris as the MIDI device. Once you have it running, play some keys on the Solaris. Do you see notes appear on the Input Monitor window? Do you also have a regular MIDI interface (5 pin). If so, can you confirm that the regular MIDI interface is working? Please, accept my apologies for not answering earlier, as I have just got into the fórum and read your answer. Thanks for all the indications, I'll check it tonight (once I get back from work), and I'll let you know. I use Reaper. Sorry, again, as I only thought of this subject as a pasive place to indicate bugs, thus I did not expected the answer (I've been using MIDI since that). Checked with MIDICtrl On and recognized by the device manager with no issues indicated, no signals received on MIDI-OX (it does receive from my other keyboards/synths) + working on Reaper with the same result. It works fine with my MIDI interface (Microlite Motu) though. Thanks again for the feedback + all you've done + once again, please accept my apologies. I think I've detected the issue. It seems that Solaris colides with the Creamware Prodyssey regarding USB recognition. 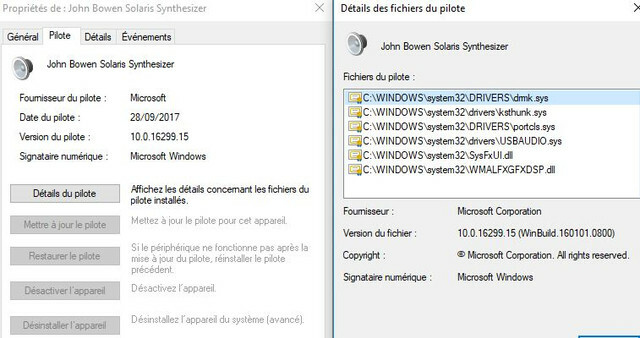 From my part (W7 64bit, reaper, tried different usb ports), from what I see, when the Prodyssey is on, the Solaris won't be recognized in Reaper (I'll just use the MIDI interface). If there's a collision that would mean that the vendor ID and product ID are the same for both products. Can you check something please? With just the Prodyssey plugged in, go to the Device Manager, right-click on the Prodyssey and select Properties. Then click on the Details tab. From the Property list select "Hardware ids". Below that in the Value box you should see a couple lines that start with something like: "USB/VID_1107&PID_1001". That means the vendor ID (VID) is 1107 and the product ID (PID) is 1001. I'm using the numbers from the Solaris here as an example. For the Prodyssey at least one of the VID or PID should be different. But if they are both the same then that explains the collision. When they are the same then Windows cannot tell them apart. Exactly the same (¿?). I'm quite surprised, I was expecting it to be different (Could it be something on my computer or W7 64bit?). So, as you pointed out, that's the issue. Thanks a lot for the feedback. Hopefully it could be resolved on later OS versions. In the meanwhile, I'll just keep using the MIDI interface. Thanks for checking. Unfortunately the original developer didn't try to put unique IDs there. (Given the Creamware/Sonic Core heritage maybe some code got copied. I don't know.) I should be able to change that for a later version.